The ResMed Swift™ FX for Her Nasal Pillows System represents continuing innovation and improvements in the already hugely popular and successful Swift™ LT series. The Swift™ FX now incorporates a soft, pliable design for the entire mask system - no hard parts at all to irritate your face! The snug headgear straps do the work of maintaining the seal, so the fit feels loose and there's no need to overtighten the headgear. The innovative vent design delivers super-quiet mask performance and gently disperses air away from patient and bed partner. 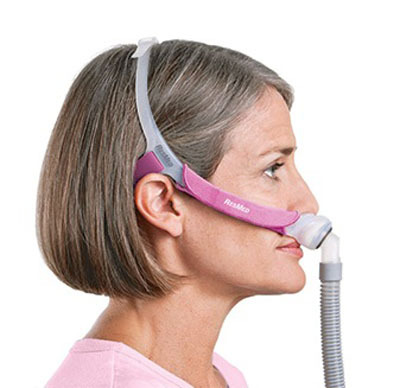 The new design of the self-guiding nasal pillows are easy and intuitive to adjust, and they partially inflate with air and press gently against your nose for a secure, stable, yet gentle seal, even at higher pressures. The parts kit is the Swift FX headgear, Swift FX short tube or frame, and one set of nasal pillows in the size selected. If you choose this option you do not need a prescription but you will need to assemble the mask yourself. Dual-wall nasal pillows seal on contact for a gentle, comfortable seal, offer a wide fit range and disperse air gently to the nose. Soft, narrow cushion with integrated flexible chamber makes side sleeping comfortable and helps maintain the seal during movement. Quiet vents diffuse and direct airflow quietly away from the user and bed partner, delivering super-quiet mask performance. Soft silicone headgear embraces the face gently and needs minimal adjustment - the default setting fits most users. Soft wraps over the headgear enhance comfort at the cheeks. Swift™ FX users can sleep on their side or their back, positioning the tube as desired.